President of Ukraine Petro Poroshenko awarded the Gold Star of the Hero of Ukraine to Ukrainian pilot, MP Nadiya Savchenko. “Nadiya Savchenko is awarded for an unbroken will, civic courage and sacrificial service to the Ukrainian people,” the statement of the President’s press service reads. Poroshenko noted that Nadiya was the first female warrior to receive that award and title. 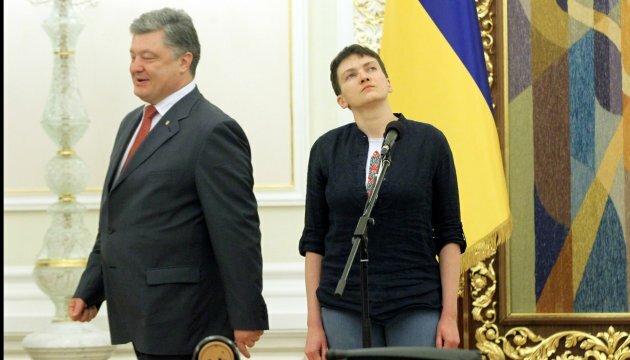 “I serve to the people of Ukraine,” Nadiya Savchenko said taking the award.